Due to her mischievous character, one thing she's surely about to succeed -is having a clownesque day on the beach. Join her for an anti-age vintage experience, whether you're an expert swimmer or just a toe dipper - jump in! Endlich im langersehnten Traumurlaub angelangt, findet „Giselle la Pearl“ die perfekte Kulisse, um sich auszuruhen und zu relaxen; aber dann kommen die Dinge anders als geplant... ein etwas anderer Strandtag beginnt. Begleiten Sie Giselle, egal ob sie den "Rettungsschwimmer" haben oder nur das "Seepferdchen" besitzen. Después de un largo tiempo esperando sus ansiadas vacaciones, Giselle la Perle está a punto de encontrar el lugar perfecto para desconectar y relajarse, pero entonces todo empieza a torcerse...Gracias a su carácter travieso una cosa es segura, no será un día cualquiera de playa. Anímate a compartir esta experiencia vintage, seas un experto nadador o más bien de secano. En raison de son caractère, une chose qu’elle est sûre de réussie c’est d’avoir une drôle de journée sur la plage ! Joignez-vous à elle pour une expérience hors du commun, que vous soyez un nageur accompli ou un touriste de passage ! 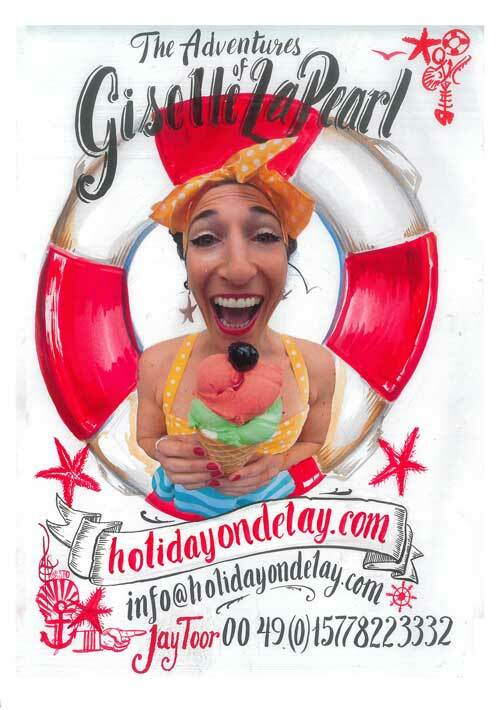 After the success of Jay Toor a.k.a Fire Fingers with her world touring solo fire show "Ms. Flames" she is coming back as Giselle la Pearl in her new street show HOLIDAY ON DELAY. The show was coached by Joanna Bassi. Coming up from a 4 generation circus family, the sister of the famous clown Leo Bassi & a great performer herself, Ms. Bassi is working nowadays as a coach/director for international circus productions. The Premier was launched in Switzerland (Vevey -"Artistes de Rue", 2013).So far "Holiday on Delay" has been touring in various important festivals in Europe & around the world.